Over the last 48 hours, I have learned the true meaning of nit picking. I’m not talking about someone who hones in on the minute details and criticizes to no end. I became a nit picker par excellence. My first grader had a rash. The rash had come and gone for a couple of weeks. I put anti-itch cream and Aquaphor and it got better, but it persisted. So, I was happy that she had her yearly checkup on Thursday. I asked the doctor to check it out. Immediately, she went for the kid’s head. Within 30 seconds she explained the cause of the rash – lice. Ewwwwwww, Lice??? Isn’t that due to poor hygiene? Do I have dirty kids? Do I have to burn everything made of fabric in my house? My mind ran in circles of panic. Then guilt. Why hadn’t I known to check for lice? Why hadn’t I checked her head? Then, the doctor confirmed my fear – the three year old had them, too. A check of my head revealed nothing. The doctor sent us off with directions to buy an OTC lice treatment, comb out the hair, wash all the linens and then the kids could go to school the next morning. We stopped off to buy the RID kit and hurried home. 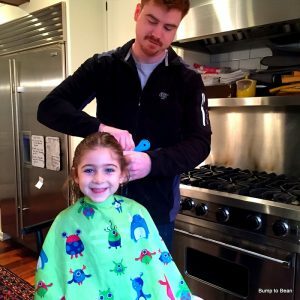 I spent the next four hours doing laundry and treating my girls’ heads with chemicals, then thoroughly combing through their hair, pulling out lice and nits. As the minutes, then hours, passed by, it dawned on me…NIT PICKING! I was nit picking! Using a fine toothed comb to find microscopic critters and then picking them out. Literally picking out nits. I felt pretty confident about my work. The next morning, I did another thorough comb-through just to make sure there was nothing left. Looked good to me! So, I dropped the girls off and informed the Head of School of the situation. Less than two hours later, the phone rang. I was in the middle of a meeting and couldn’t pick it up. When I checked my voicemail a bit later, my heart sank. The school nurse called to inform me that she had found live critters in the girls’ heads and they needed to be picked up. When I arrived, there was a line of children outside the nurse’s office. The school had decided to do a head check for all the children. Good thing, because my girls were not alone. I called our pediatrician and asked for advice.She told me that we couldn’t repeat the chemical treatment, but we could try coating the entire head of hair with Cetaphil and repeating the comb out. I spent another three hours doing just that. I then threw all the linens and stuffed animals into the wash AGAIN. I had been itchy since the lice discovery. All of a sudden, I noticed my itch focused on the exact same area where the big kid had had a rash – at the base of my neck. I freaked out and did a RID treatment on myself. When I pulled out four little suckers, I got upset. I knew that if I hadn’t been able to get all of the stuff out of the girls’ heads, how would I ever clean up my own hair??? My friend recommended I call Lice Happens. She told me they have a 24 hour Lice Line. I immediately called, explained my situation and asked for help. Within minutes, the main office had notified the local office and my phone rang. I spoke with Peter Byram and scheduled a home visit. The next morning, Peter showed up with his son. The two gents spent three hours doing the most thorough comb outs of each one of us. They also went through all the misconceptions regarding lice. They gave us a tutorial in lice removal and armed us with everything needed to deal with lice. Live removal can be fun! These pros worked on my kids for over an hour and a half, and they didn’t complain. Kudos to Peter and Kevin! I can’t say it enough, these guys were delightful (or should I say “deliceful”)! – Lice are not uncommon. In fact, they are SUPER common. 12 million people have lice right now. Why aren’t we talking about this??? 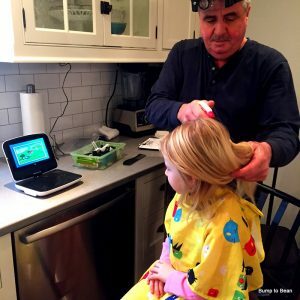 – If your kid is scratching their head, check for lice. If they have a rash around the base of their neck and/or behind their ears, check for lice. – Lice does not mean you’re dirty. Or that you have poor hygiene. Lice Happens calls this “No Shame. No Blame.” Lice don’t care if you shower once a day or once a week. They just want your scalp blood. – There’s no season for lice. They are a year-round problem. Wherever there are kids huddling together, sharing a small handheld device, reading together, telling secrets, etc. there can be a spread of lice. – Lice live only on the hair/scalp. They cannot live off the head. So, there’s no such thing as a whole house ininfestation. Lice don’t live on anything but the hair/scalp. Also, once they are off the head, they cannot reattach. – Most lice are dead 6 hours after they get off the head. Within 24 hours, they are 100% dead as they cannot survive that long without feeding on the blood of a human host. – Lice cannot infest your pets or any animals, for that matter. – Lice do not jump or fly. The only way to spread lice is by head-to-head contact. Literally, your kid’s hair touches another kid’s hair that has lice. The lice will crawl from one hair to the other. So, pull your kid’s hair up/back.And maybe the selfie craze should end, as it’s a sure fire way to spread lice!!! – Killing adult lice does not mean you are done. Hence, the chemical treatments (like RID or NIX) aren’t great. First, they are insecticides. In hind sight, I wouldn’t have used RID if I knew this ahead of time. Second, they can only kill adult lice, leaving behind the nymphs and eggs/nits. Since the chemicals are technically neurotoxins, they can only affect the adult lice. Nymphs haven’t developed a neurosystem and the eggs/nits are in a shell through which the chemicals don’t penetrate. Third, even if you kill the lice, they won’t fall out of the hair. You need to get them out by combing. I don’t think there is enough good information out there. Frankly, there is a ton of misinformation proliferating in the world because no one wants to talk about this dirty, lousy subject. Get it? LOUSY. Yeah, the origin of lousy is the word louse, aka lice in the singular. I am thrilled I called Lice Happens. They taught me so much! Using non-toxic, pesticide-free products, they did a thorough, manual comb-out. Then, they handed us the reins. We learned the proper way to comb out the hair (always keep the tines of the comb against the scalp). We realized that the RID comb is an inferior product. We purchased their NitPickerPro in order to do the required follow up comb outs. We also bought their pesticide-free enzyme mousse which helps release the nit glue (the substance that adheres the nits and eggs to the scalp). So in short, what’s the process for lice removal??? 1) To screen/check for lice, you need to wet the hair. Lice, but more importantly nits, are hard to detect in dry hair. 2) Begin at the scalp and comb through the entire head of hair. Wipe the comb off onto a paper towel. If you see nits, nymphs or lice, you’ve got lice! Time to do the treatment and go to step 3. If you find nothing, CONGRATS! Go about your life. 3) Get the Lice Happens Head Lice Treatment (Enzyme Mousse). Do a thorough comb through of the head by dividing the hair into small sections. Comb (keeping the tines against the scalp and then through the entire length of hair) each section in four directions (up, down, right, left). Wipe nits and lice onto a paper towel. Repeat until the hair is free of nits and lice. 4) Do comb outs every day for 14 days. Use the enzyme mousse every other day. Some nits are super persistent and you may have missed some eggs. You want to comb through the hair every day to get anything that is left. WHAT’S THE MOST IMPORTANT TAKE AWAY??? If you have kids in the house, you should be checking them for lice. The best piece of advice I got from Lice Happens is to do a quick check every Sunday night. That way, I will definitely catch an infestation before it gets out of control and won’t require so much work as this crazy breakout. There’s no miracle potion that does the work for you. The only way to get rid of lice is to comb them out manually. If “the plague” happens to you (and let’s face it, lice happens! ), call this family run business. Lice Happens really saved the day for us. I am going to bring them into our school so they can demonstrate proper treatment techniques to the families in our community. My one request to you if this befalls your family…Notify your school, so that other parents can be proactive. Also, tell anyone whose child came into close contact with your infected child. Wouldn’t you want to know?